Undigested Scots revival block in proper hôtel manner enlivened by an intricate skyline of dormer windows, crowstepped gables and turrets with ball finials atop. Singularly detailed turret at western end - corbelled from a chamfered corner up into square and then up into round; decorative only, apparently no room within. In front, St Michael's Well, 1720, the best of the town's wells. The well-head is surmounted by a figure of the Archangel Michael with the town's arms. It is inscribed comfortingly: 1720. Saint Michael is kinde to straingers. A spring well, enclosed by a stone building 4' square and about 6' high. On its top is a rudely carved stone representing the figure of St. Michael brought from the Old Cross Well (SDD List 1963). It was built by the town in 1720, and on the front of it is the inscription 'St. Michael is Kinde to Strangers' and the date 1720. The oldest public well supplying the street-St Michael’s Well figure 18, with its inscription 'Saint Michael is kinde to straingers', to the east of The Cross. 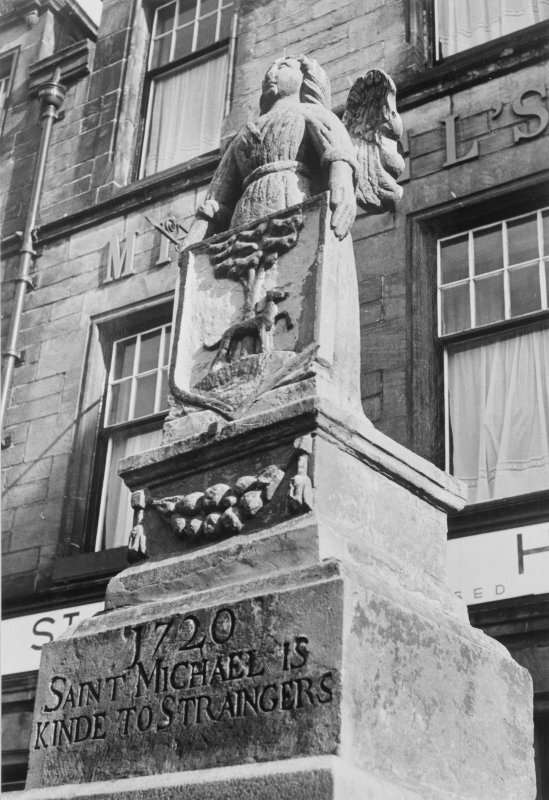 Originally, this stood on St Michael's Wynd or, as it was sometimes termed, Easter Wynd; but in 1719, the council agreed that the supply should be brought down to the High Street in lead pipes and the present well was built in 1720. In 1773, its reservoir was enlarged to improve the supply. It was moved again in 1802, a little to the south-east, to 'improve that part of the street adjoining to the Easter Wynd'. Unfortunately, as a result of an accident, it no longer has its water spout, but the figure of St Michael, removed from an earlier Cross Well, is displayed prominently. Information from ‘Historic Linlithgow: The Archaeological Implications of Development’ (2000).